The Toy Poodle is an elegant, lively, small dog with a profuse, but well-groomed and clipped curly coat. A good Poodle has a square silhouette, with approximately the same length as the height at the withers. It is very amusing and clever. Its innate showmanship, made the Poodle into an excellent circus performer. There are three varieties of Poodle: Toy, Miniature, and Standard. The three sizes are considered one breed and are judged by the same standard. Today, the Poodle is primarily a companion and show dog, though it can learn almost anything. The Toy Poodle is sensitive, remarkably intelligent and trainable. It is said to be one of the most trainable breeds. It is very amusing, pleasant, happy, perky and lively. Some love to play with children, but some are sensitive and nervous. Usually it does best with older, considerate children. It can be somewhat high-strung. It may snap if it is teased or surprised. Socialization at an early age is a must. It tends to be quite reserved with strangers. It does tend to bark a lot. This is a very good watchdog for its size, seldom becoming aggressive. Unless trained, this breed tends to bark a lot. Usually it is friendly with other dogs and non-canine pets. Your Poodle will keep in better spirits and be fitter if given regular opportunities to run and play off the leash in a safe area. The Toy Poodle is not demanding as far as exercise goes. Very profuse and dense, harsh texture, either curly or corded. Extensive grooming is needed. It must be bathed regularly and clipped every six to eight weeks. The traditional clips were developed to lighten the weight of the coat for swimming and protection to the joints and major organs from cold, but many owners opt for the plain lamb clip - the same length all over, because it is easier and more economical to maintain. This breed sheds little to no hair and is good for allergy sufferers. The Poodle\'s coat may be groomed into three basic styles: - the "pet clip" or puppy clip (under 12 months), with relatively short hair all over the body - the "English saddle" clip, - the "Continental" clip with the rear half of the body shaved, bracelets left around the ankles and pom-poms left on the tails and hips. All other clips are not admissible in shows. Subject to dislocated knees, epilepsy, diabetes, Addison\'s disease, Cushing\'s disease, hip dysplasia, hypothyroidism, Legg-Perthes disease, von Willebrand\'s disease, genetic eye diseases, PRA (Progressive Retinal Atrophy), and bloat. 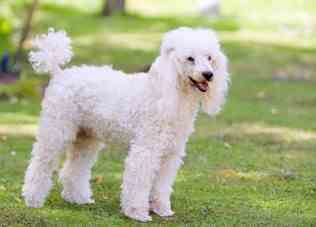 Toy Poodles can be exercised indoors or in a fenced yard, but they will also enjoy a walk on a leash. Apartment living is fine if enough exercise is given. The Toy Poodle is adaptable to the city or suburbs. The best owner for this breed would be a gentle owner living in the city or suburban area. Quick to learn, Toy Poodles need a gentle but consistent approach to training. Learning Rate: Very High. Toy Poodles are very intelligent. Obedience - Very High. Problem Solving - Very High. The training and learning abilities of this breed have made it a popular show dog and companion.